"New York, New York I want to be a part of it" ... well finally I am - after seven and a half hours cramped on board a plane and several hours on various coaches. Now, instead of being cramped on the plane, we are sharing ten to a room, in an otherwise lovely hostel called Jazz on the Park, on Duke Ellington Boulevard, just off Central Park. Exhausted we collapsed into bed and still slightly confused by the travelling I woke at half past six in the morning, a time I have not seen for quite a while. Downstairs in the hostel you get "breakfast in a bag" obviously an American concept but despite its unattractive name it was surprisingly good. We hunted out the closest subway station which turned out to be on 103rd Street and headed downtown to the Staten Island Ferry, which amazingly is free of charge. 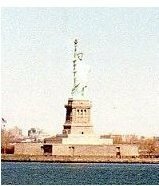 We got our first proper view of New York on the ferry trip and saw the Statue of Liberty. The weather was absolutely beautiful: cold, crisp and sunny. A perfect day if I wasn’t feeling quite so ill with a cold - something we all acquired at some time as a souvenir of our stay in New York. Once our feet were firmly on solid ground again we walked along the pier and into China Town. China Town is not for the squeamish: live frogs and turtles in bags were being sold on the street for just a couple of dollars (presumably for eating). We decided to move on for lunch and strolled to Little Italy where we had a gorgeous and inexpensive lunch. After lunch we set off to find MOMA, the Museum of Modern Art. Along the way we revelled in the yellow cabs, walk/don’t walk signs and everything else stereotypically associated with New York. However as a Londoner I am surprised not to have encountered anywhere as crowded as a London street. This probably has something to do with the fact that their roads and pavements are twice the size of ours, and not that it wasn’t busy. MOMA had a retrospective exhibition by the photographic German artist Andreas Gursky, which was compiled of larger than life, colourful photographs of buildings, people and landscapes. 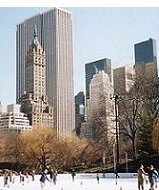 On the way back to the hostel we walked the length of Central Park looking at the ice-rink and making plans to go there on our last day. The park is absolutely gigantic yet in parts it wouldn’t seem out of place in Disney World. After two very busy days we rather pathetically retreated to the hostel ordering "take out" with plans to make up for it the following evening. This morning I awoke to find that it was snowing and even colder than yesterday! With a slightly more adjusted body clock we headed to Coney Island, a forerunner of the Disney Land culture, with fairground rides, freak shows and the like. To all intents and purposes, it was an American Blackpool (an English holiday town) but it felt like we were at the end of the earth and about to drop off: it was snowing, deserted and everything was shut with hardly a sane American soul in sight. We headed back to the subway and found a public toilet - an extreme rariety no matter how decrepid. A Thai lunch in Greenwich Village was amazingly good and again very reasonably priced. We walked around the Village buying chocolate and presents for friends and family, regularly stopping for coffee and cakes to warm up as it was feezing and still snowing. 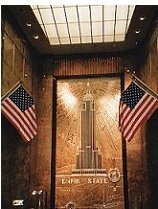 We took a yellow cab to the Empire State building. The fare was very cheap compared with English cabs, only $2 each. By this time it was getting dark and we couldn’t wait to see the skyline at night. Rather luckily we didn’t have to queue for tickets and lifts and within about ten minutes we were looking over New York at night: a breathtaking spectacular of lights and skyscrapers. It was an amazing experience but the cold weather we had suffered all day, and thought could not be any worse, was about ten times as bad at the top with the added wind chill. From the Empire State we walked to Times Square, a magnified "Piccadilly Circus" (London) and found a charming Mexican restaurant for dinner. Next we stumbled across a bar that would not look out of place in London with its authentic Scottish staff in traditional dress. This was followed by a cab ride home in the early hours. We attempted to sneak into the room without waking those who had already gone to bed and hoping that the next people to come in would have the same courtesy. After an early start we walked across Central Park to the Metropolitan Museum of Art. On the way we bought pretzels from street traders and had our photographs taken with the Hans Christian Andersen statue which is in the park next to the pond. The Metropolitan housed an interesting range of American historical paintings and contemporary work in an impressive skylit gallery but it was not really a "must see" experience. This was followed by a more exciting visit to the nearby Whitney Gallery which was showing truly inspiring work. All six floors of the gallery were totally engrossing. There was a gift shop with great presents for people and unlike most British galleries the prices were reasonable. Next we pounded the streets of Chelsea, a place full of smaller, diverse galleries. However, in this area, a map and gallery guide is as essential as an interest in art. We found the most amazing black and chrome decorated diner which, unlike those seen in American films, was extremely upper class. The food was excellent and the staff were very friendly. Tipping in New York is expected at about 15-20% instead of the English 10% tip. For dinner we had Chinese take-away in the little white boxes that they have in all the American sitcoms and you wish your local "Chinese" had ... for $20 we had enough food to feed eight instead of the four. In the evening we did more walking and stopping for drinks but this time we exchanged coffee shops for bars and pubs experiencing New york at night. We stumbled across the pub where Dylan Thomas, the Welsh poet, took his last drink, before dying from an alcohol-induced coma, a rather sobering thought. After emptying our rooms we headed back to China Town and then Chelsea to see all the last minute things we hadn’t had time to experience before. Finally, what we had been waiting for all week: ice skating in Central Park. Braving the elements and surrounded by skyscrapers we spent an hour or so skating. As usually happens on the last day of a trip, the weather improved dramatically and for the first time it was actually warm enough to shed all our winter layers. We tried not to fall over on the slightly slushy ice, although I can testify as to how cold it was on at least one occasion! Not bad considering I hadn’t skated for ten years. An amazing experience though and one I would not have missed.